This move is necessary to develop my bishop to g7, and the first move heading into the Dragon variation. Black's pawns on d6, e7, f7, g6 and h7 have a "dragon formation" and inside that pawn chain lies the dark squared bishop – probably the most important piece in this setup – it attacks, defends and threatens and often times White will want to use his Queen and bishop battery with Bh6, to trade off that bishop. It is a tactic that would fail at this point, because White's queen will be overworked defending the bishop and the knight. Attacking the light squared bishop through the knight. This will allow knight takes knight in many situations. Which explains White's reply. White's 13th move was out of character with the Sicilian Defense Dragon variation. He doesn't want to trade either of his bishops for these knights, and he should be trying to break into Black's kingside with his pawns, and now his bishop is in the way. I was threatening Nxe4, because the Queen was the piece defending the knight on d4, I would get a pawn, knight and queen for 2 pieces and a rook, which would put me way ahead, but this was a very passive defense. Now the game is really taking shape. Blacks pieces are very well coordinated, attacking the White king – doubled rooks on the semi-opened c-file, the black queen well placed to attack, and both bishops stand ready to attack as well. Meanwhile – White's dark squared bishop isn't doing much – and the pawns on f4 and h4 prevent it from defending anything. Whites rooks are not participating in any attack and his knights are weakly defending each other, and will find it tough to move as they are pinned to the rook and defense of a2. And the Queen is soon to be proven overworked. See how the bishop cannot help because of the pawn on f4? 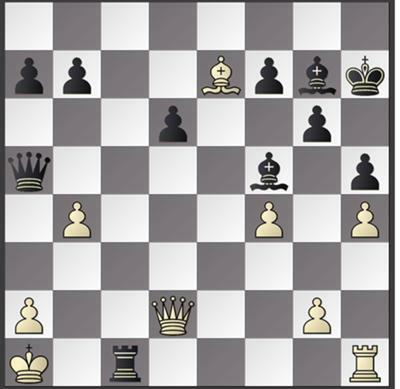 Notice how the rook is immune from capture, by the queen or the pawn, due to the immediate loss of the queen when Bxc3 with check. The game is over, but a very nice mate soon follows, as my opponent plays on. This game is an excellent example of the power of the Sicilian Dragon defense, and the power of Black's dark squared bishop. Good luck to all of those who choose to employ it, I believe you will find some pretty incredible results. Join in and write your own page! It's easy to do. How? Simply click here to return to Sicilian Defense Labyrinth.